This beautiful designer strapless dress by Sincerity Bridal in size 12/14 was never actually worn at a wedding, hence there are no pictures available of the wedding day, but you will be the first to wear it! It was tried on a couple of times and has been professionally dry cleaned and stored in a full zipped covering in a smoke and pet free house. 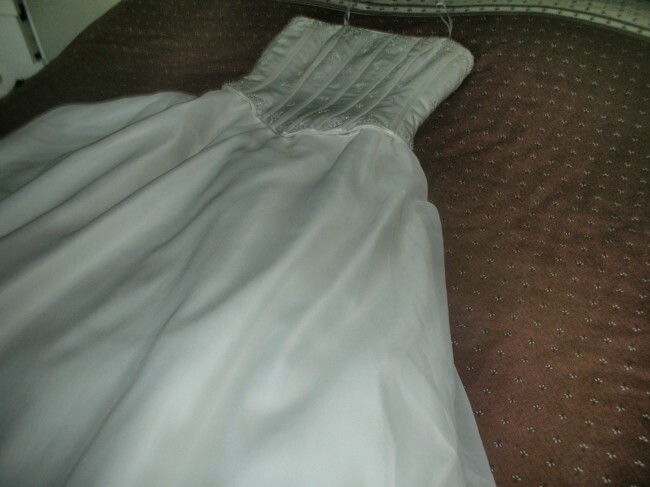 It has a superb beaded bodice, a full skirt and a long full train. The back with beading and bow is as atrractive as the front and gives a lovely rear view. The skirt has 4 layers including 2 layers of net underskirt and a fine covering to the main fabric. Since the bodice is made from quite narrow panels, it would be straightforward to resize it smaller. Any inspection of this dress is welcome, any questions please ask. The dress is located in GL10 in Gloucestershire. Once you send a message, Daphne can invite you to purchase the dress.